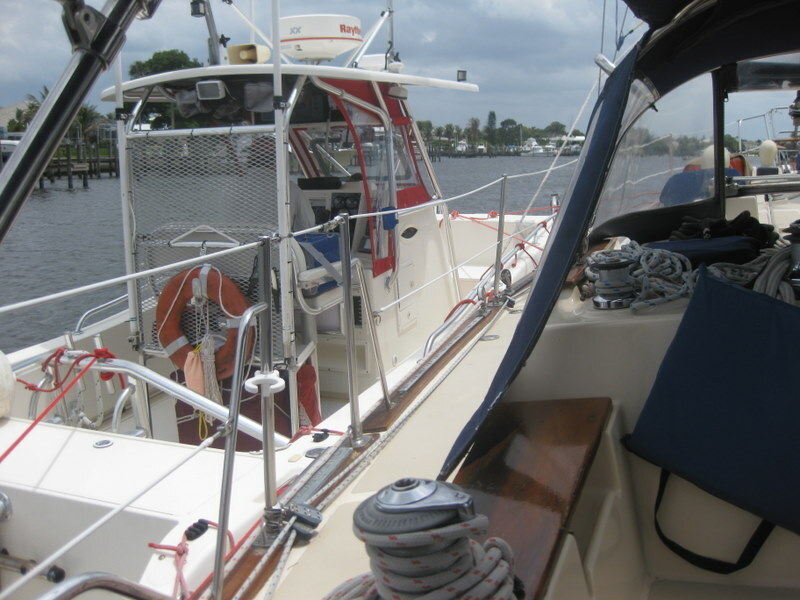 Here we are in Stuart, Florida, ready for our run up the Saint Lucie River to Indiantown where we have decided to keep the boat for the summer. We left Nassau after the Keys and reversed our route from when we came down. 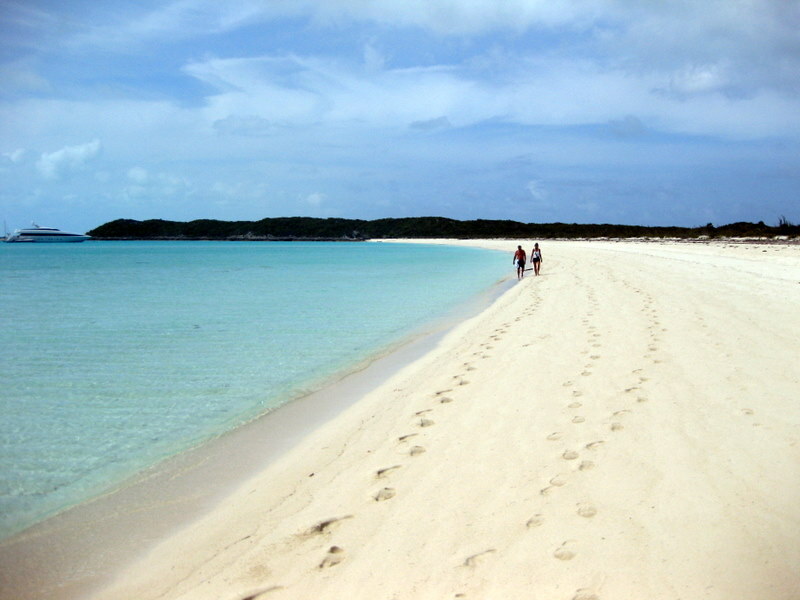 The Berry Islands are nice and we will spend more time there someday. 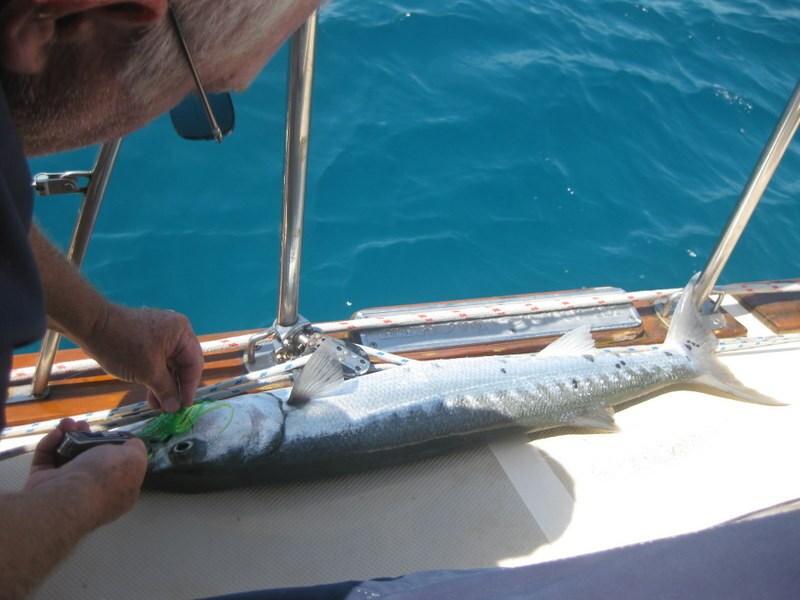 Caught a couple of fish – one edible, the other a monster barracuda. Made Mike’s look like a minnow. Into Freeport with a little excitement along the way. We were hit by a squall. It seemed like it would never stop although it was probably only half an hour but my goodness, the rain!!! It rained so hard that it washed a bird’s nest out of the boom. Who knew we had a birds nest in there but we certainly had mud and twigs all over the deck afterward. Berlington took Glen around to a marine store for beer and hose clamps! Problem solved. We had a benign crossing. No wind, no waves, just 17 hours of motoring. On the way over we watched the Coast Guard board a huge motor yacht. They veered over towards us but when they saw we were Canadian (Canadians don’t pack heat!) and that we smiled and waved, they sped off in search of bad guys. 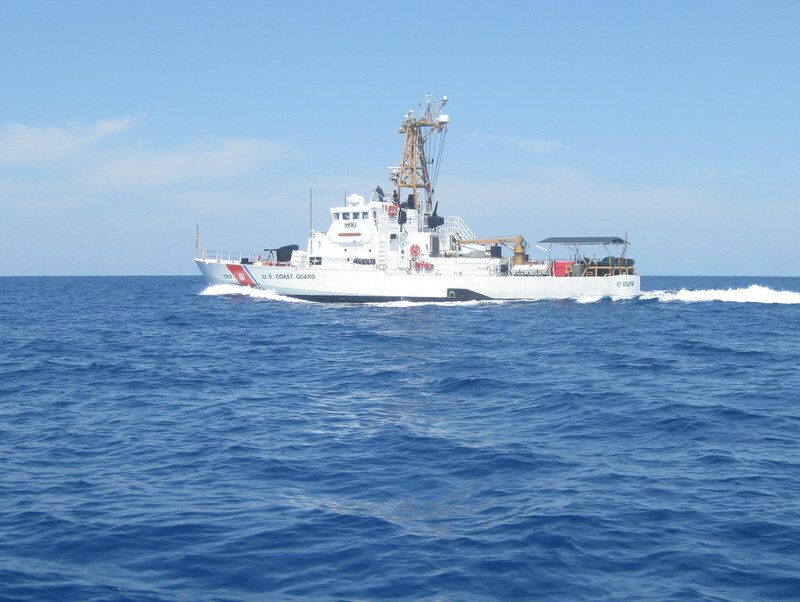 Changed course in mid Gulf Stream… literally. We changed our minds about going north. 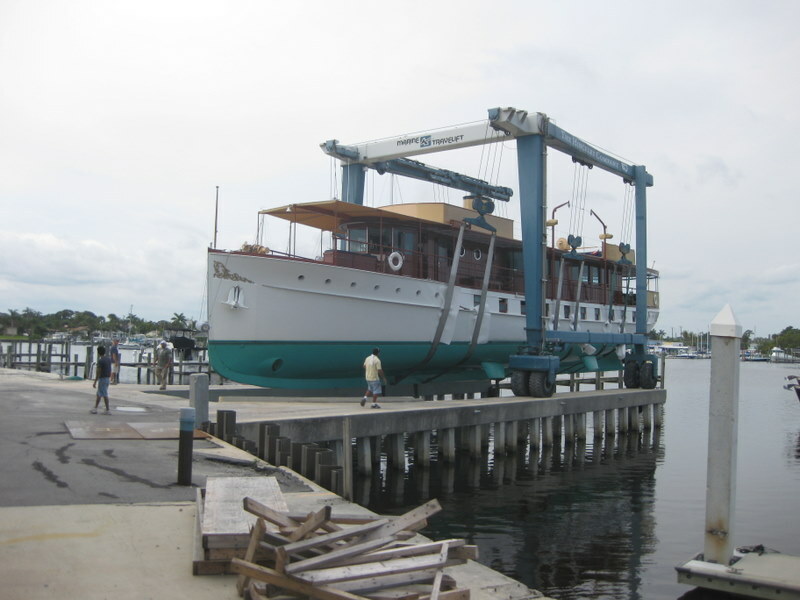 We will keep the boat at Indiantown Marina in Florida. The marina is 20 miles inland and hasn’t been bothered much by hurricanes. Our insurance company is happy – and so are we. At 11 pm, after a harrowing entrance into the Fort Pierce inlet we anchored, had a glass of champagne and had a great sleep. Clearing Customs involves putting up a quarantine flag when you arrive, grabbing a taxi and reporting in at the nearest airport to fill out a ton of forms. So the next morning we shared a taxi with another boater in the same situation and were done in an hour. We stayed in Fort Pierce for a couple of days and then left for Stuart. On our way, we decided to fill up with fuel in Manatee Pocket. When we were fueled and ready to go we found that the engine would not start. Turns out, the water spilling over the engine caused some damage. We were towed to the nearest boatyard where mechanics spent a little time and we spent a lot of money to solve the problem. Now we have a shiny new starter solenoid!!! 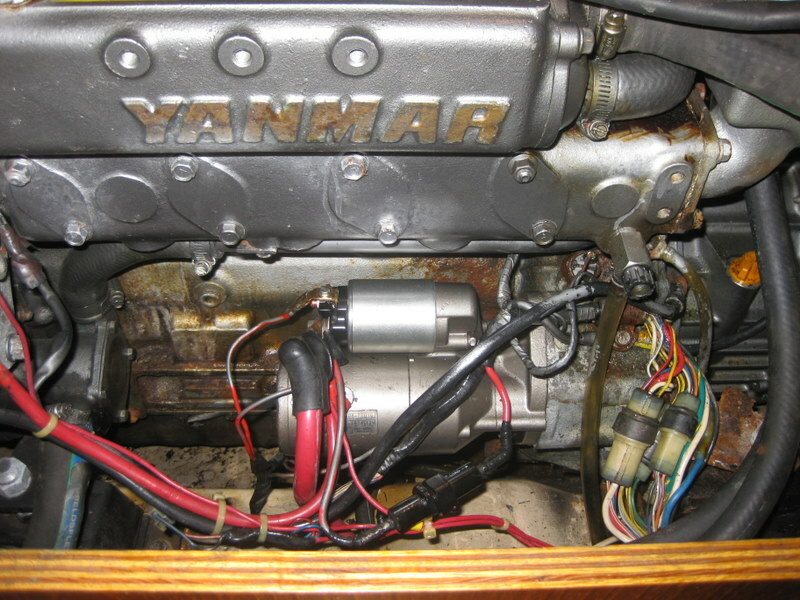 Yan Diesel with his New Solenoid! We are down to some odds and ends in the pantry. Pam is creating strange things with canned black beans, onion, green beans and salad dressing. She created nachos a la sausage for lunch yesterday and later announced that Vienna Sausage will not be making our provisioning list again. We will put the boat away on Monday or Tuesday and head home right after. It will be good to see our family and friends… and we are already looking forward to the new adventures of the Blue Pearl next year! Within two hours of saying good-bye to the Macdonalds, the Keys were on the boat and we were heading towards Volleyball Beach to our anchorage for the night. 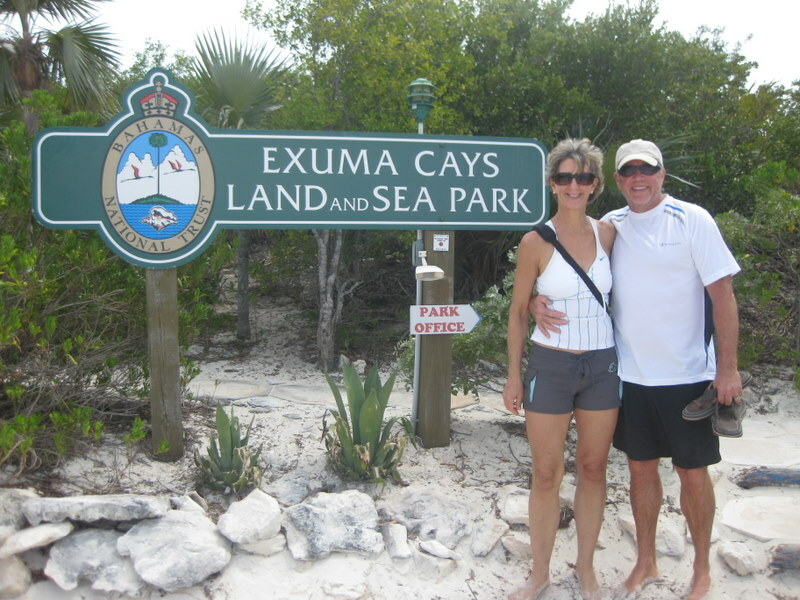 We have had a lovely time exploring the Exumas with all of our family and friends and so it was great to be able to treat the Keys to some fabulous places in the Exuma Cays. We had fun swimming around Georgetown (although it was a bit disconcerting when the boat next to us pulled a shark out of the water while we were enjoying gin and tonics on the deck). 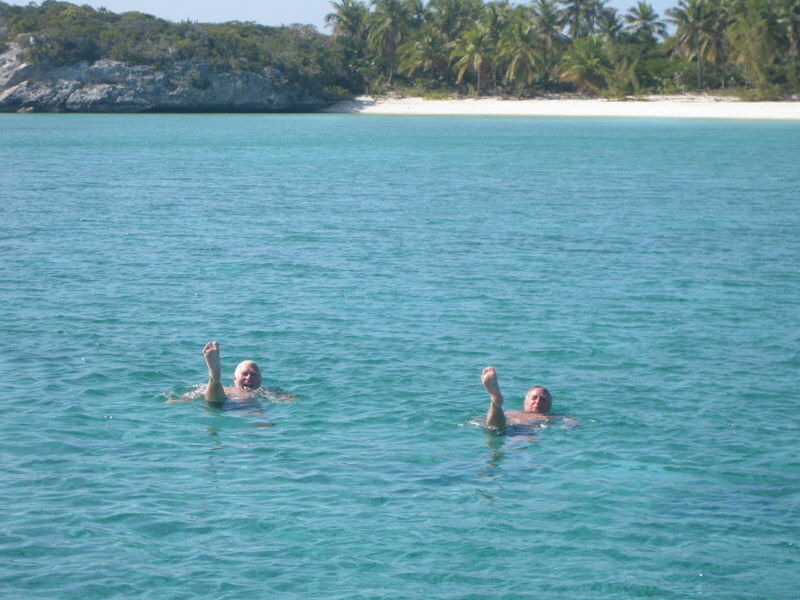 Swimming is nice in Georgetown but it is exquisite in the quiet anchorages along the Exuma chain. Don and Pat had us in the habit of swimming in the morning and the afternoon so it was easy to carry on that way with the Keys. It is amazing to find yourself in ten feet of water and be able to pick out shells on the bottom. So the Keys were able to see Georgetown, Rudder Cay, the Majors (where pigs will swim out to your dingy for food), the park at Warderick Wells, Hawksbill Cay, the west coast of the infamous Norman’s Cay and Nassau. 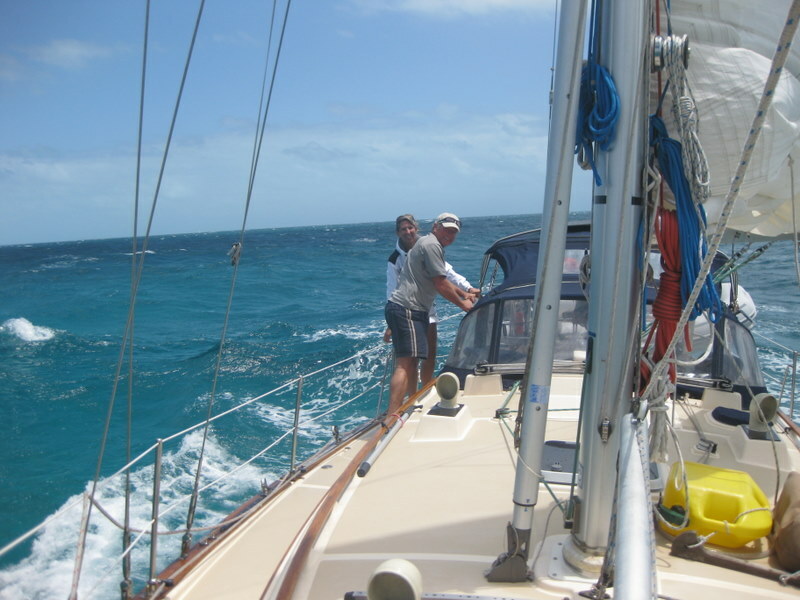 The seas and the direction of the winds were perfect and we enjoyed some of our best days of sailing. Our last day with the Keys was a doozy. 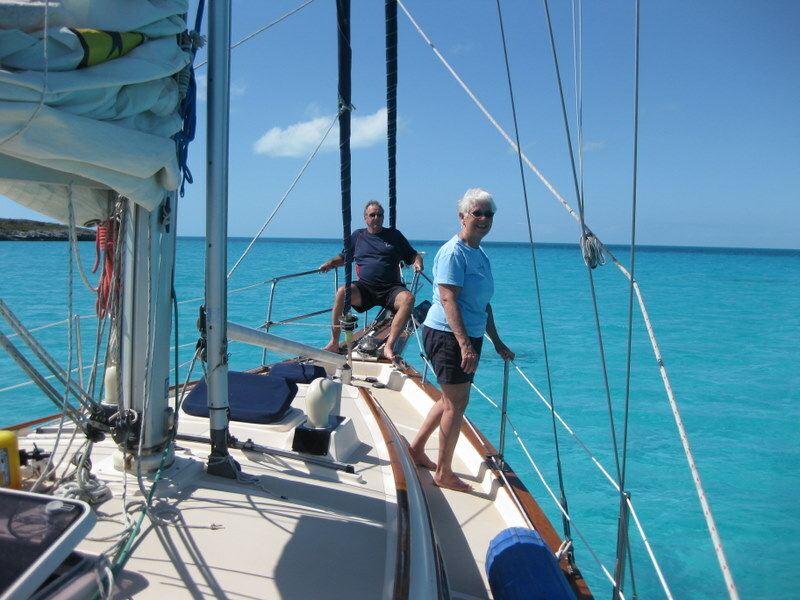 We left Norman’s Cay for the trip to Nassau in relatively good conditions, however as the day progressed, the wind increased and the seas grew from ripples to six foot rollers. We were maintaining incredible speeds but it was becoming increasingly lumpy. We crossed the Yellow Banks in seas that made it difficult to see the coral heads. We crossed our fingers that we weren’t near anything dangerous. Once across the Banks, George spotted a dolphin and despite the fact that the boat was pitching and rocking, George, Deb and Pam made their way to the bow to watch him play in the bow wave. 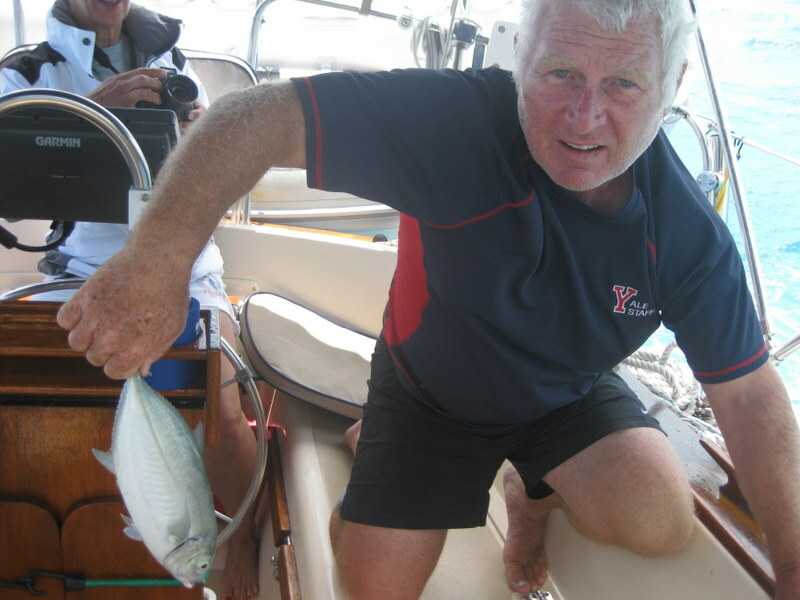 While we bounced through big waves and big winds, the fishing line screamed and soon we landed a two pound jack. So, dear reader, you might think that the day was full enough… it gets better. 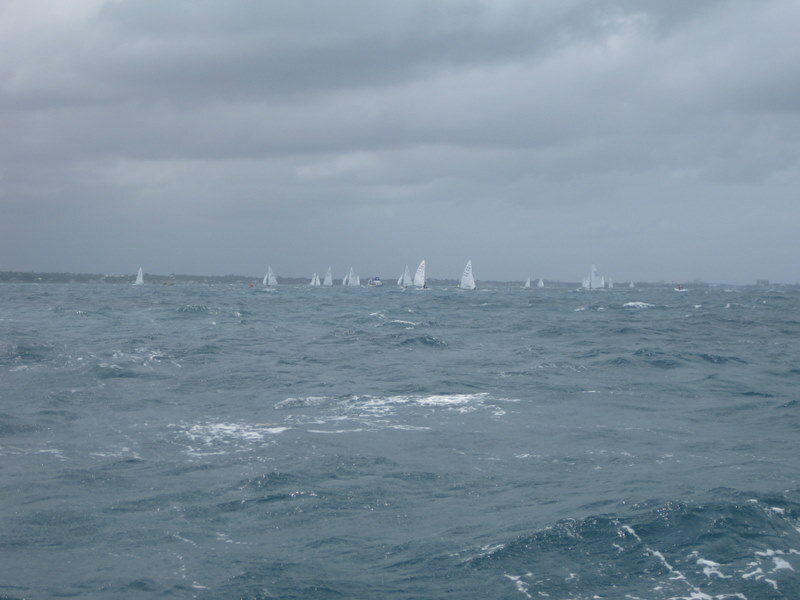 As we neared the entrance channel to Nassau’s harbour, thirty small sailboats were engaged in a regatta which meant we had to change course or enter the race. We changed course. Coming into Nassau Harbour the wind at our back was still thirty knots. We coasted up to the marina but then had to dock in that wind. The dockmaster was unavailable and so Captain Chaos performed brilliantly bringing the bowsprit close enough to the dock for the courageous Admiral Pam to JUMP onto the dock and secure the bow. 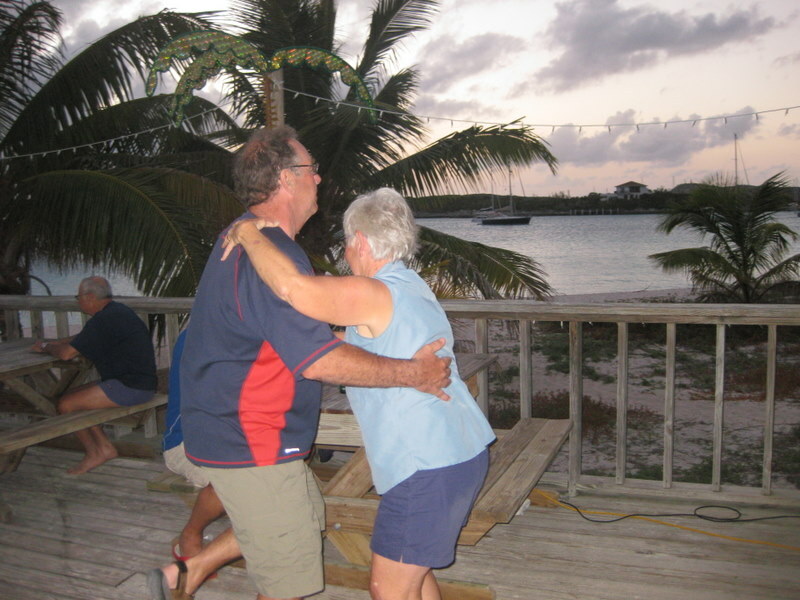 Deb and George watched in wonder as Pam, single handedly (with the help of a Bahamian bystander) wrestled the Blue Pearl onto the dock. Beers for all. 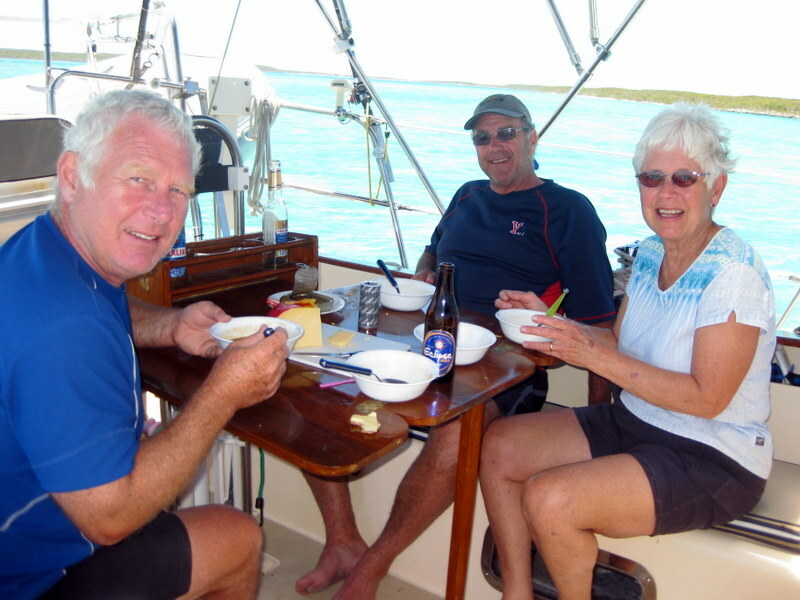 We made a quick run to Potter’s Cay for conch fritters and conch salad and then returned to the boat to settle in for the evening. Realizing that the Keys had not tasted cracked conch, Glen and George went back to Potter’s Cay to buy some for dinner. And now, dear reader, is when the ship hit the fan. Walking back with cracked conch in hand, Glen and George decided to take a short cut along a poorly lit path. 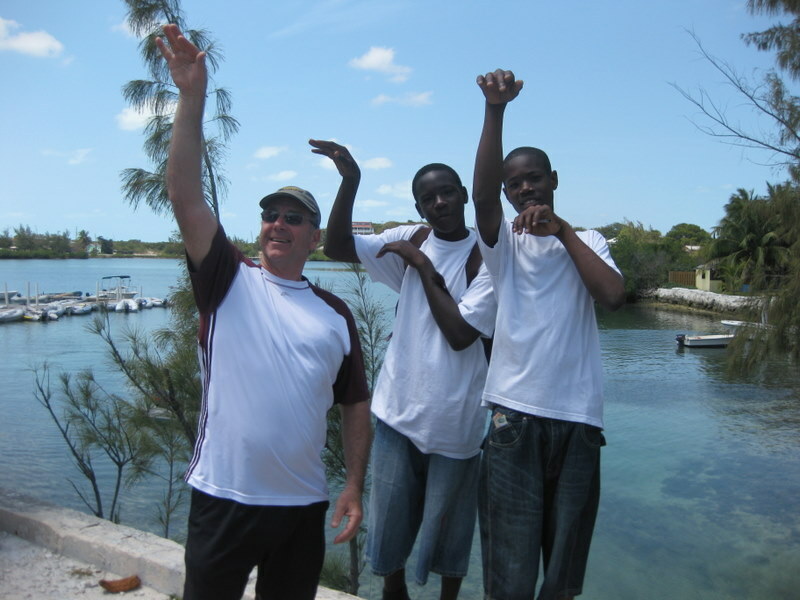 Unknown to Glen and George, two young Bahamians were approaching them from behind. One of them punched George on the back and yelled, “Give me your f*cking money!” The rugby player and the hockey player reacted differently than the would-be muggers expected. There was cursing, yelling, chasing and violent kicking with flip flopped feet. The vice-principal in them both surfaced and they yelled at the muggers to get to the office and wait for the wrath of Mrs. Fowler. The young bucks fled, leaving George and Glen wide-eyed, full of adrenaline and wondering what to do next. We suspect that in later years the story will be embellished with knives, guns and drugs, and the $6 carried by George was a fat billfold of thousands, but just then that was enough excitement. We have been warned about the crime in Nassau and we have now seen it first hand. Although scary, it was not near enough to mar an otherwise perfect cruise. So… the Keys are on their way home and so are we. Berry’s, Freeport, Florida, Brunswick… Abbotsford. We were dropping the anchor in Elizabeth Harbour, Georgetown, when we received a phone call from Don and Pat’s taxi driver. “Where are you?” said Don. 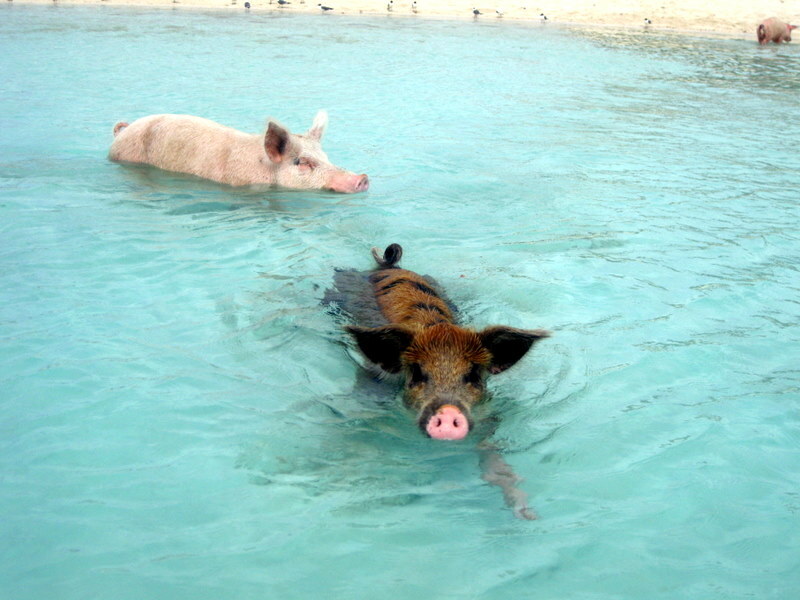 We were 5 minutes away by dingy and met them at the dock at Exuma Market. What a treat to see them!! The next day we did some exploring, found the school where we are to deposit our books, facilitated by the South Seas Cruising Association (SSCA.) We did some provisioning, found some conch for salad and cracked conch and settled into our surroundings. We left the next day to explore north. 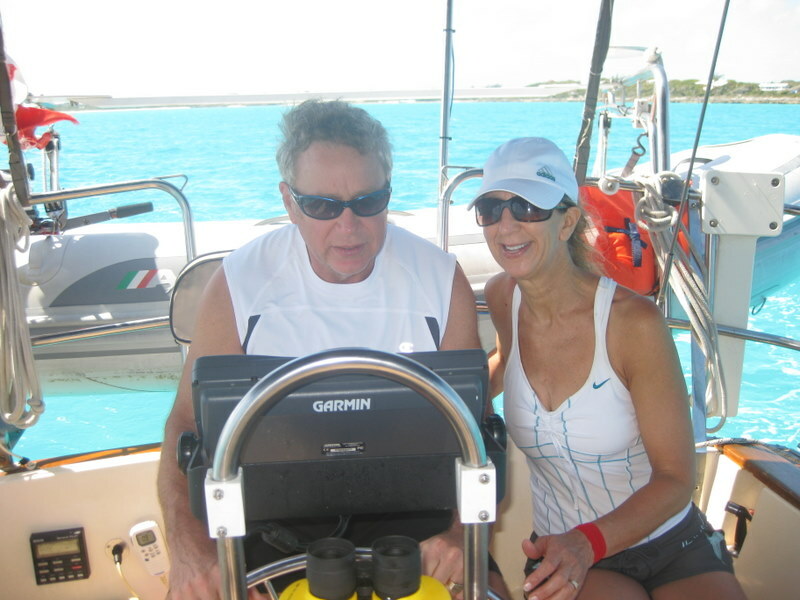 After a four hour sail we arrived at Rudder Cut and “cut” in to anchor off Rudder Cay. Don and Pat were in the water almost before we had anchored. We spent a pleasant, quiet evening at anchor. 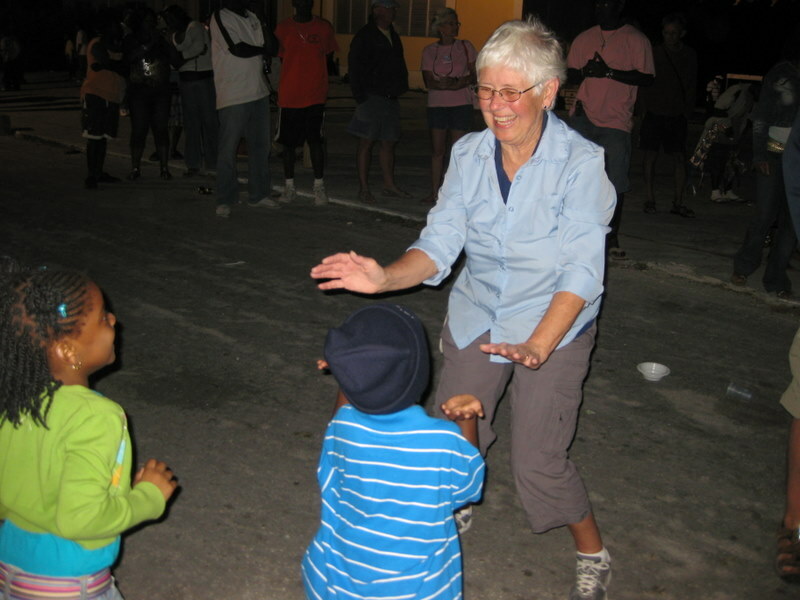 We had heard about a big Easter celebration at Black Point so we set that as our destination for the next day. Black Point was a huge hit. We saw the locals fight it out in basketball and volleyball. Don was particularly distracted and spent a great deal of time trying to engage with the basketball activities. We think he was looking for another gold medal. 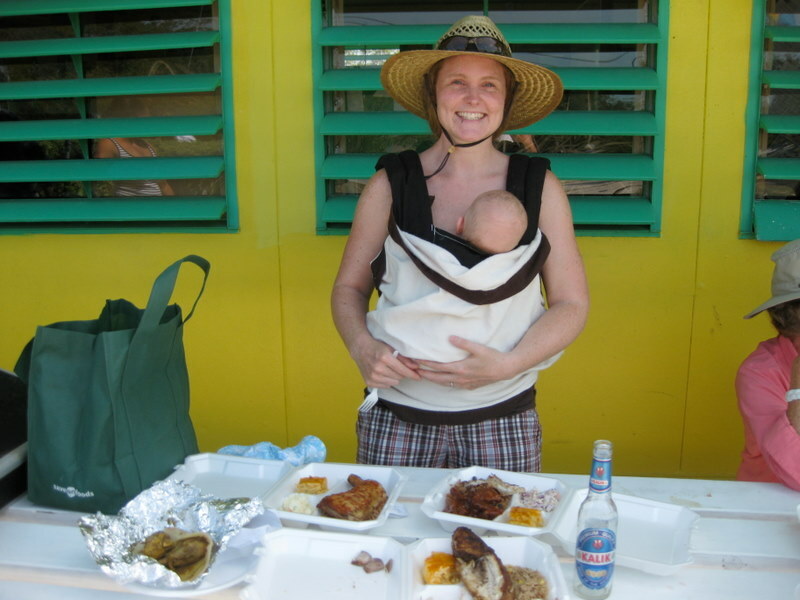 We had some great local meals; chicken, ribs, fish, etc. The highlight was the Junkanoo parade on Saturday evening. The whistles, drums, brass and dancing made for an exciting evening and it was great to share the event with friends. We were joined in the celebration by more than 50 other cruisers. On our last day, we went to the “Garden of Eden”, where Willie Rolle has collected driftwood for over 50 years. He has pieces that resemble mermaids, iguanas, whales and other creatures. Too bad we were sober or we might have been able to see some of the images in his narration. We left Black Point for Little Farmer’s Cay so we could watch TV and connect to the internet. A wonderful sail in the turquoise water. We toured Don and Pat through the Ocean Cabin, JR the Woodcarver’s place, past the school and through the rest of the community. At Ocean Cabin we met Terry Bain, the proprietor. He shared with us his opinion on many topics. What a character! So that took an hour and after that we returned to the boat for refreshments. Later we walked the runway and had a swim at the beach. Monday morning we were up for the 6:21 a.m. launch of the space shuttle Discovery. Looking north we saw the orange glow of the shuttle and watched it for a few minutes until it disappeared into the low clouds. Our second launch this trip! We let go of the mooring ball at Little Farmer’s Yacht Club and headed out the cut. The wind and waves made for a rolly trip so we cut back inside and motorsailed to Darby Island. We enjoyed our lunch in the cockpit, despite the howling wind. There were whitecaps in our soup and we had to hang on to our crackers! Glen gave us a tour of the castle and the cave that he and Luke had explored. Back to the boat for a swim and happy hour. Don scraped some barnacles from the hull to earn his beer. Once again we poked our nose out into the Sound to head towards Georgetown and found high winds and swells. We travelled in those conditions for a couple of hours and then pulled into Lee Stocking Island, a new place for us. It is home to the Caribbean Marine Research Centre. 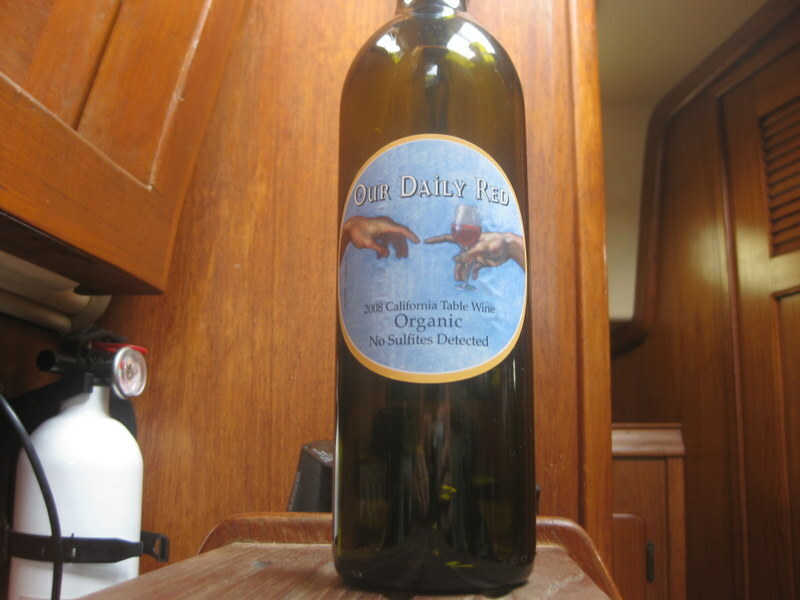 We had heard that they do tours of the facility but have lost funding and are short staffed. We radioed in and were granted permission to land but never met up with the staff ashore. Maybe another visit. We moved the boat south one mile to a beautiful bay occupied by only two other boats. Another swim in the unbelievable water. Don and Pat have spent a good portion of their time with us swimming!! 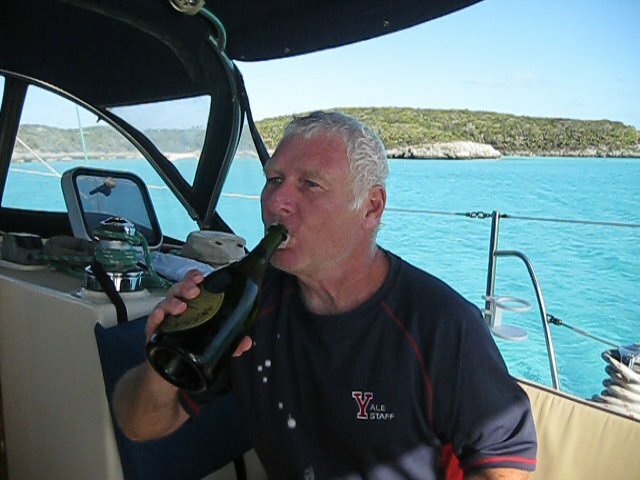 Glen opened the bottle of champagne given to him at his retirement by the Yale staff – a special place for a special event! Here's to Yale - and terrific colleagues! 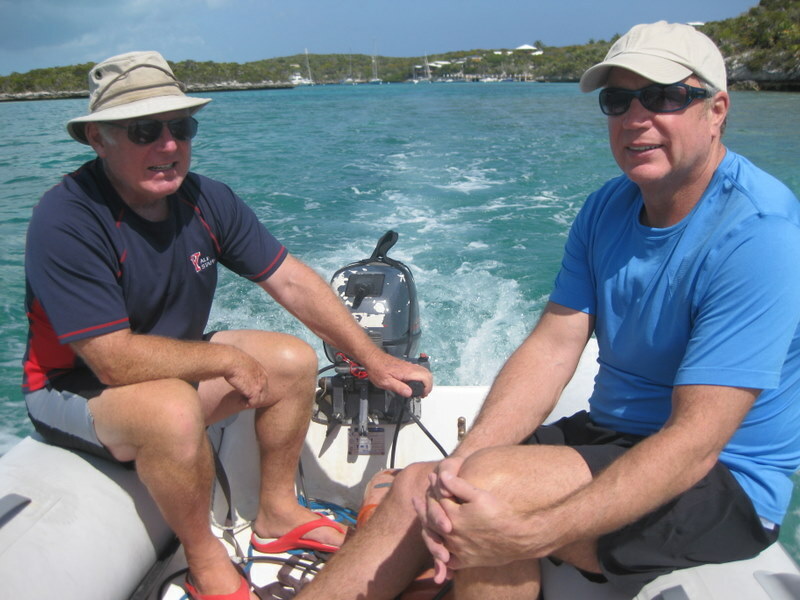 Wednesday, April 7 – again out into the Exuma Sound to travel to Georgetown for the Macdonald’s flight out the next day and the Key’s arrival. Their planes cross within 30 minutes of each other! Our 20 mile trip was into the wind and we did not make very good time. Luckily we had sandwiches prepared ahead so no one had to brave the inside of the boat during the trip. Glen is the only one of us who can be below when the boat is rolling. About a half hour away from Conch Cut into Elizabeth Harbour, our fishing line screamed and we were all planning a delicious fish dinner. Glen saw a fish jump in our wake and the line went slack. No fish tonight! We anchored near Stocking Island, near where we were a week ago. Another swim and happy hour and then to shore for a dinner at the Chat ‘n Chill. Wonderful food, a bit of dancing, chatting with other boaters and the staff. No shoes, no shirt and you will still get service! Thanks, Don and Pat, for dinner. We have enjoyed our time with the Macdonalds. They are looking forward to the next leg of their trip in Florida. 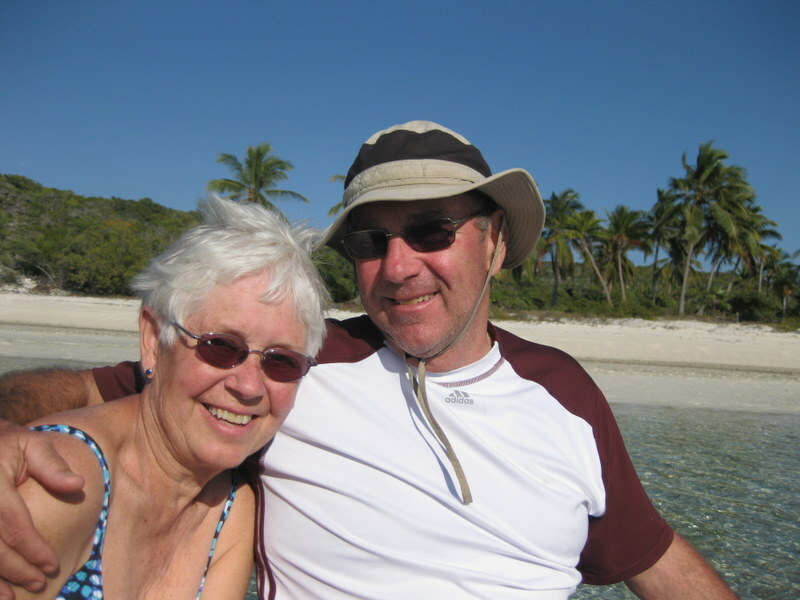 They will be doing the Florida Keys while we will be hosting the George and Deb Keys. 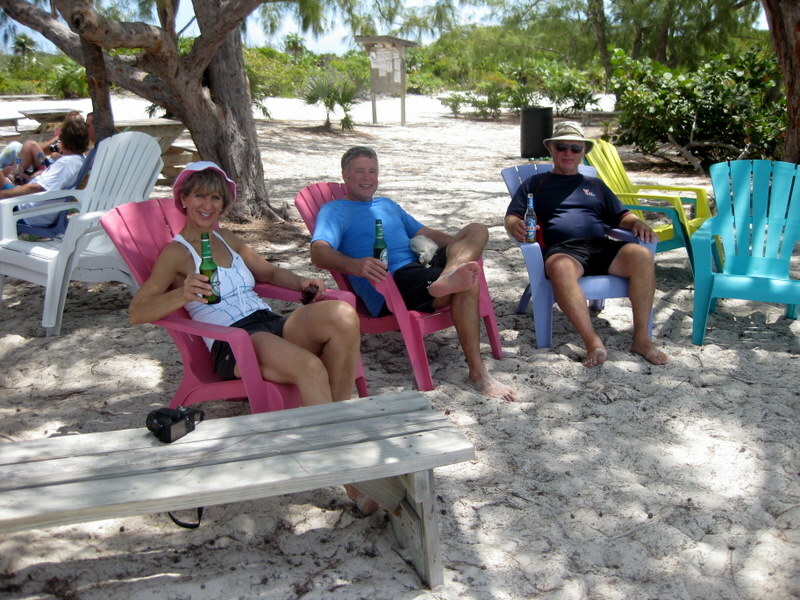 We had planned to get to Georgetown with Jen, Luke and Jackson but getting a flight reservation was problematic so we hung around Darby Island, Rudder Cay and Little Farmers instead of heading further south. They were able to leave on Flamingo Air from Little Farmers Sunday morning to connect with their flight home from Nassau. We watched them take off from the end of the runway. It was lonely on the boat after they left. It was wonderful to have them with us and to be able to spend time with Jackson. On Saturday, we all went to the school fair. Great fun. There are 10 kids enrolled in grades 1 through 11, all boys. There are two rooms - the elementary room and the secondary room. The beer shack for the fair was across the street and it must have generated lots of cash for the school. What a good idea! The ring toss game was raging until Luke got there with his juggling balls - then the Juggler became the main event. 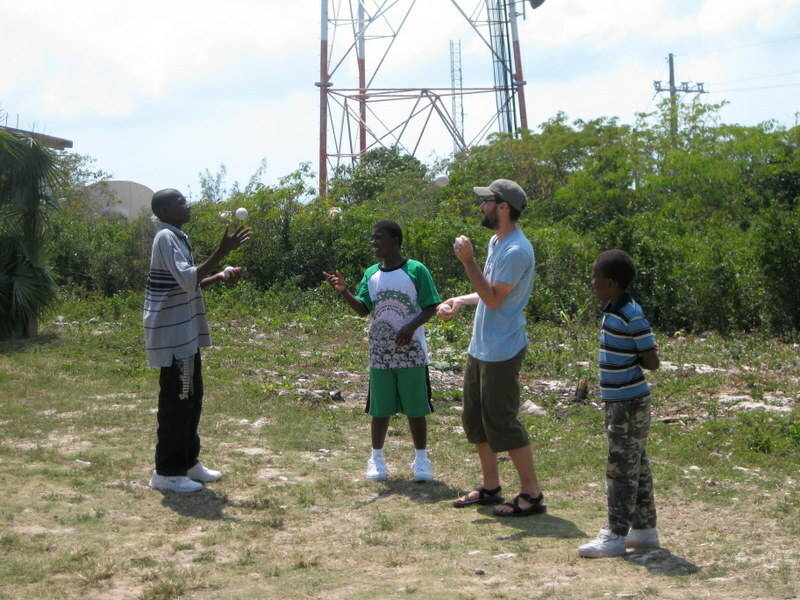 Luke had the boys trying to juggle and told them how they could make their own juggling balls. We wished we had brought some supplies to get them started. Glen and Luke played musical chairs but lost to JR, the Woodcarver. We ate chicken, fish and ribs with baked macaroni and coleslaw - yummy!!! It was our hottest day and Jack was feeling the heat so back to the Little Farmers Yacht Club to sit under the palapa and cool off. When the kids left we had only 3 days to cover the 40 miles to Georgetown to pick up the Macdonalds. Sunday afternoon we got off the dock - with much trepidation as the 20-25 knot wind was pushing us broadsides onto the dock. We didn't even hit one piling this time! We stuck our nose out in the Sound but the wind was blowing right in our faces with 5 foot seas so we decided to try on Monday. Monday was the same. So, with Don and Pat arriving Tuesday at 3 we decided that it was now or a night in a hotel for them. The front had passed and the wind had clocked around to the north, so with the breeze from behind we motor-sailed to Georgetown. The waves gave us a bit of rolling but it was a pleasant trip through the ink blue water. Keeping our eye on the clock, we dropped our anchor just as their landing gear hit the ground. Hopefully their taxi ride into town and our dingy ride to shore will get us to the Exuma Market dingy dock at the same time!! We thought it was tight getting into Nassau the day before the Inmans but this is really cutting it close! We sure are looking forward to seeing Don and Pat!